American golfing teams have been on the receiving end of a hat-trick of hammerings - and another may be heading their way in Germany this week. 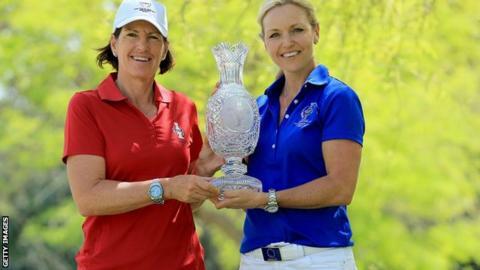 These are the events that stick in the memory and Europe's women defend the Solheim Cup, won 18-10 in Colorado in 2013, in the wake of a brilliant performance from the amateur men of Great Britain and Ireland. They completed a record 16½-9½ victory in the Walker Cup at Royal Lytham and St Annes on Sunday. This, of course, followed Europe's 16½-11½ triumph at Gleneagles in the Ryder Cup last year. Of the four biennial transatlantic trophies only the Curtis Cup, in which the amateur women of Great Britain and Ireland take on their US counterparts, resides in American hands. Carin Koch's European side will be desperately keen to ensure this remains the case after the contest at St Leon-Rot, near Heidelberg, this week. They are bidding to win three in a row for the first time. Four years ago they achieved an epic 15-13 win at Killeen Castle in Ireland and in 2013 romped to a record-breaking triumph at Colorado Golf Club. Europe's women, it seems, have caught the trend of their male counterparts in the Ryder Cup. Although the bookmakers have Juli Inkster's Americans as the slight favourites, Europe should be quietly confident of retaining the trophy. Whichever way it goes, though, we can be sure the match will be a compelling spectacle. And this is the real value of these team competitions. Even when they are one-sided, they portray golf in its most exciting light. The allure of thrusting such an individual sport into a team environment never seems to wane and we will also see that this weekend in tennis' Davis Cup, as Great Britain host Australia in the semi-final in Glasgow. In golf, the Ryder, Solheim, Walker and Curtis Cups allow fans to show a partisanship that is far deeper and more passionate than that at individual events. Roars for Rory McIlroy are louder at a Ryder Cup than they are when he wins a major. That element of tribal conflict provides the edge. It was more than evident for the amateurs at Lytham and will be apparent this week for the women in Germany. But these contests should be taken purely on face value. It is foolish to look any deeper than the result because there is rarely a legacy. When I was asking captain Nigel Edwards what his team's Walker Cup win meant for Great Britain and Ireland, I was kicking myself. It was a stupid question. All it meant was that America had lost. Again. It didn't mean 21-year-old Jimmy Mullen, who emulated Luke Donald and Paul Casey with four wins out of four, will definitely go on to be a world beater - although he may well carve out a fine professional career. It didn't mean America's leading amateur, Maverick McNealy, will struggle in the paid ranks. Four years ago GB and Ireland beat a team containing none other than Jordan Spieth. The fact he was on a losing team did the Masters and US Open champion no harm at all. Indeed, the experience of team golf probably helped make him such a well-rounded figure, one who now finds himself at the vanguard of his sport. And that's the real key to these matches. They are precious experiences that few who play or witness forget in a hurry. The fact the US are on a hefty losing streak does not mean American golf is useless. Their Walker Cup skipper, John 'Spider' Miller, had most of the world's top amateurs at his disposal. Miller was determined not to make the mistakes of Tom Watson's Ryder Cup captaincy and clearly engendered an excellent spirit among his side. Yet it was found wanting on the demanding links of Lytham in weather perfect for seaside golf. Edwards was equally adept at preparing his team and generating a winning spirit. That's all a captain can do, then it is up to the players. This is the task of Koch and Inkster in Germany this week, and a close contest seems certain. It is a huge occasion, even though both teams spend the rest of the year living in the shadow of a remarkable talent ineligible for the match. Eighteen-year-old New Zealand sensation Lydia Ko became the youngest female major champion with her stunning victory in the Evian Championship on Sunday. Ko's was the performance to provide a legacy because it is impossible not to see her dominating the women's game for years to come. For this week, though, the 24 players competing for Europe and the United States grab the limelight to showcase women's golf. Aside from American Lexi Thompson, who finished second to Ko in Evian, no players from either team truly distinguished themselves in the year's final major. By Friday this will not matter and will have no effect on the destiny of the Solheim Cup. That will be decided in the unique and frenzied atmosphere of partisan team golf. And whether or not the Americans have been beaten again, there are sure to be a host of memories to treasure.